Alex Strohl. You’ve probably seen his work all over Instagram—and you’re probably already one of his nearly 2 million followers—but allow us to make a brief, completely unneeded intro. 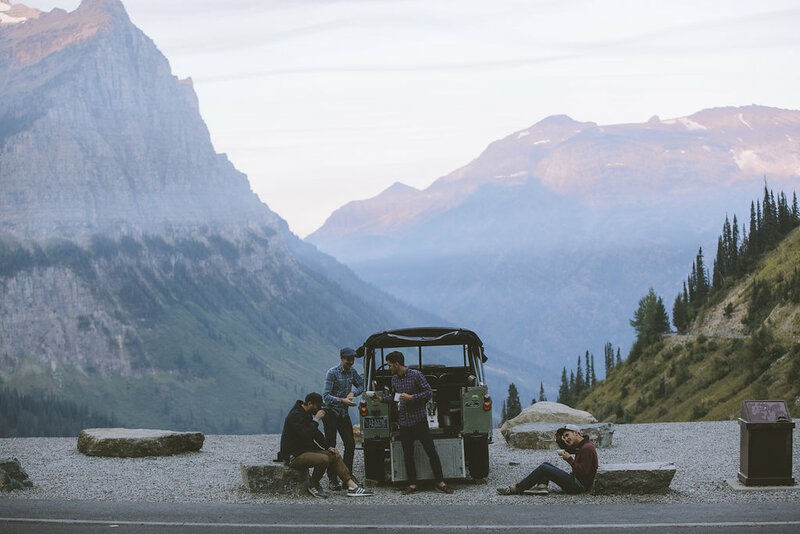 Alex Strohl is a Madrid born, French photographer, adventurer, and avid home espresso nerd. His photography has been featured in Forbes, Vanity Fair, and Gentleman’s Journal, and his list of collaborations are teeming with household names like Apple, Google, Land Rover, Arc’teryx, and on and on and on. 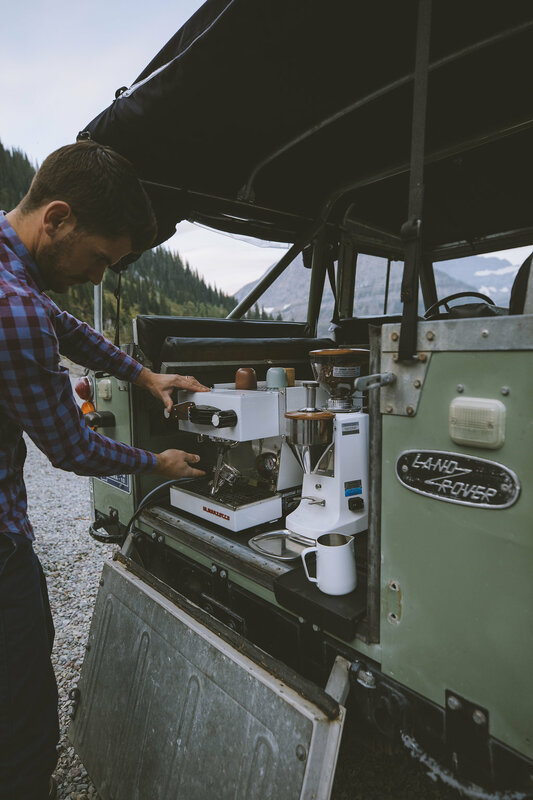 When he’s not at home in Whitefish, Montana making espresso on his Linea Mini and doing work in his studio, he’s out trekking to the most remote corners of the earth with his life partner Andrea Dabene. 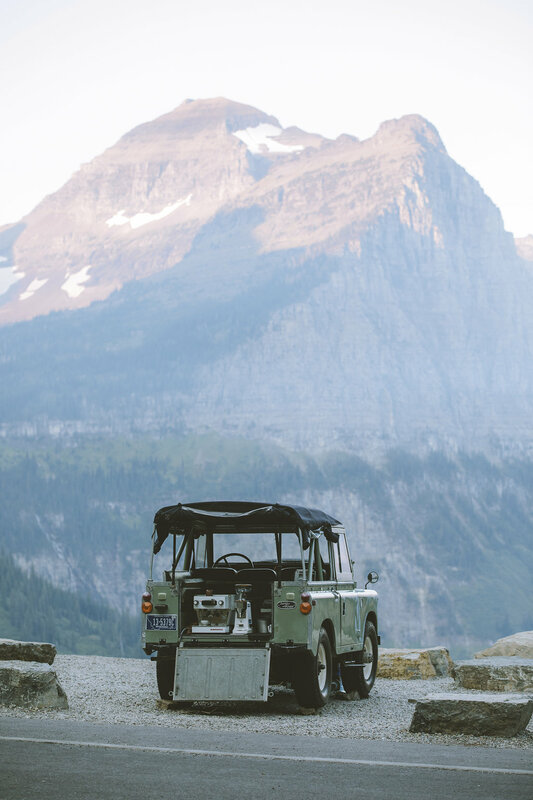 Alex recently took a sunrise trip into the mountains with a gorgeous white & walnut Linea Mini in the back of an old Land Rover Series II (1950’s!) to make espresso for his friends. 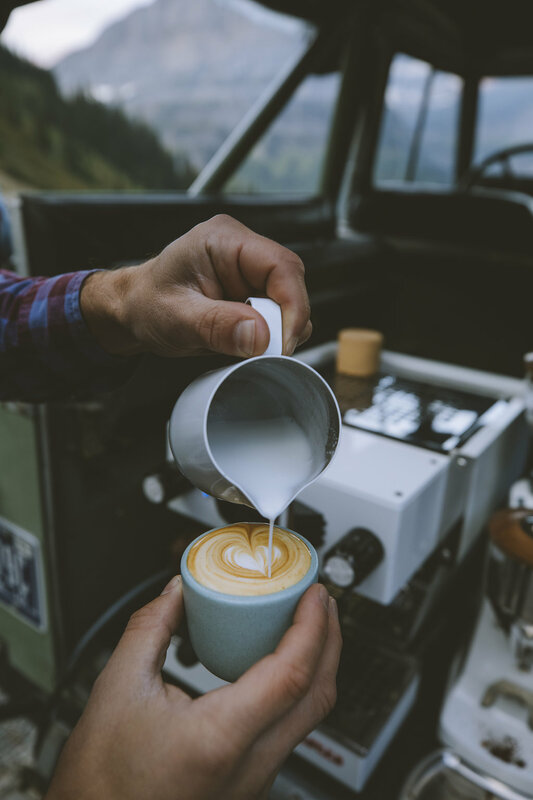 Since that’s not something we see every day, we sat down with him to talk a little bit more about his world and just what making espresso in the mountains was like. Enjoy! Tell us a little about yourself. Maybe a few things about your life up until this point and what you do now. I’m a nomadic Madrid raised, french adventure photographer. When I was 11, I boarded a plane to LA by myself to spend the entire summer at my aunt’s house. I was so blown away by the culture that I came back with spiky blue hair, a skateboard, baggy pants and a promise to myself: one day I will live in LA. I ended up keeping my promise, but not for long. Andrea-my wife- and I moved there in the fall of 2015. About two months after that we were driving North, fast, to a log cabin on the shores of Montana’s Madison river near Yellowstone NP. We couldn’t stand the heat or the traffic in California so we booked it north and we now live in a remote ski-town called Whitefish in the state of Montana. Because I spend a good part of my life outside either on skis or a bike or on feet photographing people experiencing the outdoors it ended up being the perfect base camp. 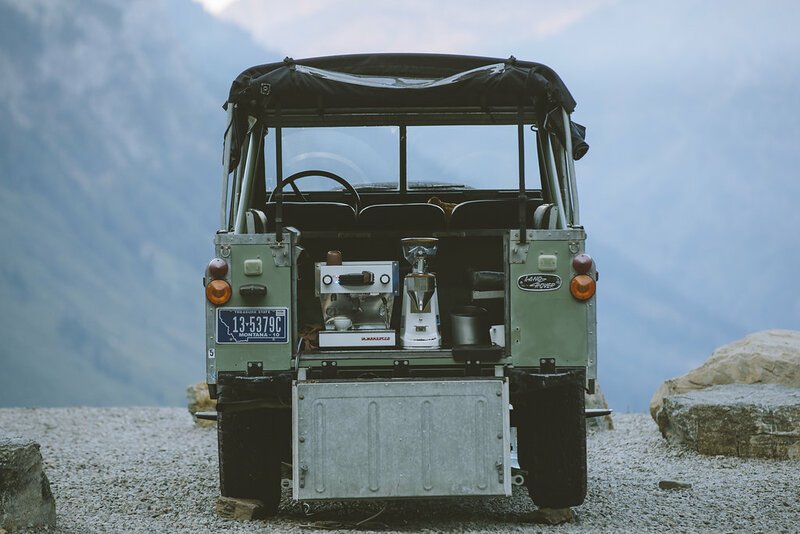 You recently hauled a Linea Mini up into the Mountains to make espresso at sunrise, which is probably on a few bucket lists out there. What can you tell us about that trip? What do we need to know? The whole idea was a bit silly at first when we were planning it. But as the first thick, heavy, shots came out of the Mini and the first rays of sun illuminated the valley we knew we were onto something rather good. The inspiring part is that it wasn’t that hard to pull off. The big thing was finding the generator to run the machine on which we borrowed from a motorcycle store in town. The rest was smooth sailing, besides maybe driving the old Land Rover Series IIa up the mountain pass, it took a little while and we thought we were going to miss first light. The evening before we loaded up the car with the gear in the car, had a short night of sleep and by 4am we were leaving the house headed to the mountains! What was your full espresso setup for that shoot? I dont know if we should get into milk but I’ve found the Horizon Organic whole milk to be the most consistent. And the one that is easy to forget: a power strip. What was your camera and gear setup? You grew up in Spain and France, right? Can you tell us a little bit about the espresso cultures there? We moved to France from Spain when I was 15 so I got to experience both cultures. For France I would say that it’s a bit different. 99% of my friends and family invariably order ‘un espresso’ after a meal. Sometimes they will indulge in a ‘noisette’ (similar to cortado) or a ‘café au lait’ (latte) but from my experience, anywhere outside the hip spots of the main cities (like Ten Belles or Café Belleville in Paris) when you order espresso you will get a bath or warm water with a taste of burnt coffee. Even in fancy boutique hotels it’s the same case. And most of the time they have great setups (even though I can’t remember how many places I’ve been that don’t have a proper tamper) and I think it’s generally because of lack of training on the staff. And it is also the ‘standard’ this is how coffee should taste: burnt. But it’s not all awful, as I said there are a handful of places in most big cities where you can get a perfectly crafted cup of coffee, and props to these shop owners for sailing against the wind. 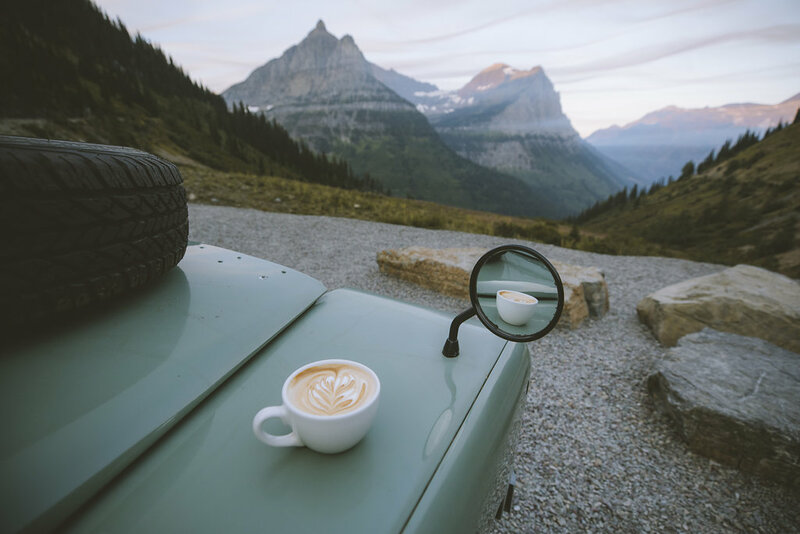 You’ve been to some incredible places around the world—if you could pull a shot of espresso *anywhere,* where would it be? Oh this is tough. Probably at home because I cherish the rare time spent there so much. Where did things start for you with coffee at home, and what’s your current home setup? For me it starts with a clean large bar where I can tinker and experiment. I’m still in the early stages of coffee knowledge and every time I meet a high flying barista I will inquire about this or that method. Do they time weigh their shots ? What’s their favourite cups to pour on ? What water temperature are they running? What milk? It’s never ending. My setup is the same as above, and I’ve plumbed the Linea Mini now which I enjoy a lot. What sorts of drinks do you like to make? I love making ristrettos just because they can’t lie. If you mess it up you can’t hide it, it’s an honest drink. So anyone who comes by and wants that, I’m jumping with excitement inside. I also cherish the cortados because it’s a real challenge to try and pour latte art into a smaller cup. What are some of your favorite coffee roasters to make at home? Was there a bit of training or equipment that you feel really took your home coffee to the next level? The training does everything, if you have that you can buy the gear. But you can’t buy the experience. I’ve spent about 15 hours total training with different baristas and picking up their habits and routines has made a huge difference. When you don’t have an espresso machine at a shoot, what do you do for coffee? When I’m out and about on a trip I always pack my Aeropress, the Mini Porlex grinder. If I’m on a trip in the mountains I’ll pack the MSR Windburder Stove (1.8L) and my favorite plastic coffee mug. Have you noticed any similarities between espresso and photography? I think that photography and coffee meet somewhere on the scale of dedication and precision. Both require a love for details: Just like you need to be able to spot the color variations in your shot as it pull out of the porta filter you need to be able to spot spot the light variations outside. And being attentive to these subtle variations, lets you know if it’s a great shot or great light. I love when I can combine two passions in life, like this morning up in the alpine making coffee and taking photos. I’ve always been curious with these setups (the Volvo as well) do you just use a standard power inverter or do you need something special? Is the vehicle running when you’re using the machine? Is there a generator hiding off out of sight somewhere? Gorgeous Rover and pictures by the way. Love the MSR Windburner in more ores Rick’s applications. You really just don’t get it. 🙂 Give one a shot, I’d take it with me everywhere if I could! I have a white Linea Mini myself, along with a Monolith Flat. Just thnk the whole LR thing looks phony and over-hipsterized. Ah, okay. Probably not a fair statement on my part, sorry about that. I think that there are some legitimate things here that people are excited about, and are proud of. It looks like something that I would try to do without getting paid, I guess that’s all I’m saying. Maybe I’m just a very eccentric geeky hipster coffee guy though. I really love the read and it was inspiring and helpful (setting up the La Linea). Land Rover Defenders happens to be my favorite off-road vehicles next to FJ40s and 60s/62s. I wish I could live out in the middle of nowhere like Alex but noooooo, I married a city girl. Dang! It’s ok, there are plenty of cafes running La Marzocco machines and always spot-on espresso, cappuccinos, and macchiato. I’ve managed to try out the Linea Mini and it’s a great machine so easy to use. I still have to practice making perfect froths. I’m a hipster and I’m proud.